It was the Kirtland’s warbler that made our morning. In the red cedar ten metres off the trail, the small grey and yellow bird was all but invisible. Only when it flitted from one branch to another was there any chance of seeing it – and it didn’t flit often. The small group that first spotted the bird had swollen to a hundred birders or more as word of North America’s rarest warbler spread almost instantaneously along the trails. Patience, however, eventually paid off as the bird flew up onto an exposed branch, sat cooperatively in the open and sang its heart out for all to see and hear. There are two spring migrations at Point Pelee National Park: the birds themselves and the people from all over Canada, the U.S. and even Europe who flock to see them. Located near Leamington, Point Pelee is a peninsula that extends into the western basin of Lake Erie. It is located at the crossroads of two major migration routes – the Mississippi and Atlantic Flyways. Most importantly, it is one of the first points of land that spring migrants reach after crossing Lake Erie at night. Approximately 385 different species of birds have been recorded here, including 42 of the 55 regularly occurring North American warblers. 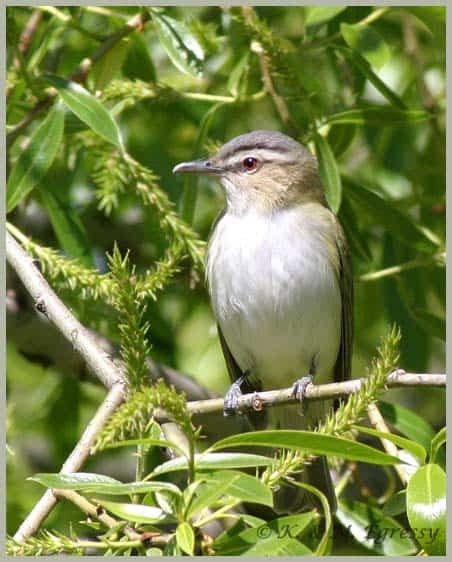 To see the greatest diversity of warblers and other songbirds such as vireos, flycatchers, grosbeaks, tanagers and thrushes, the first three weeks of May is the time to visit the park. The birds are in their brightest breeding plumage and most species are singing. They are also relatively easy to see, since the trees leaf out later here, due to the cooling effect of Lake Erie. 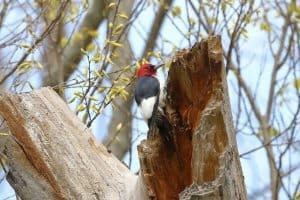 Anyone going to Point Pelee for the first time will be amazed at how easy it is to see spectacular birds like rose-breasted grosbeaks, Baltimore orioles, indigo buntings, red-headed woodpeckers and scarlet tanagers. Seeing a trio of male tanagers lighting up a trailside tree can be just as pleasurable as getting a fleeting glimpse of a rarity, skulking on the ground in a tangle of vines.The most spectacular birding occurs when weather fronts collide, forcing migrants down out of the sky in what is called a “fallout”. When this happens, you’ll need at least three pairs of eyes. One pair focused on the birds down low on the ground or in the shrubbery, another to check out what’s moving through the treetops and a third to keep track of birds streaming overhead! 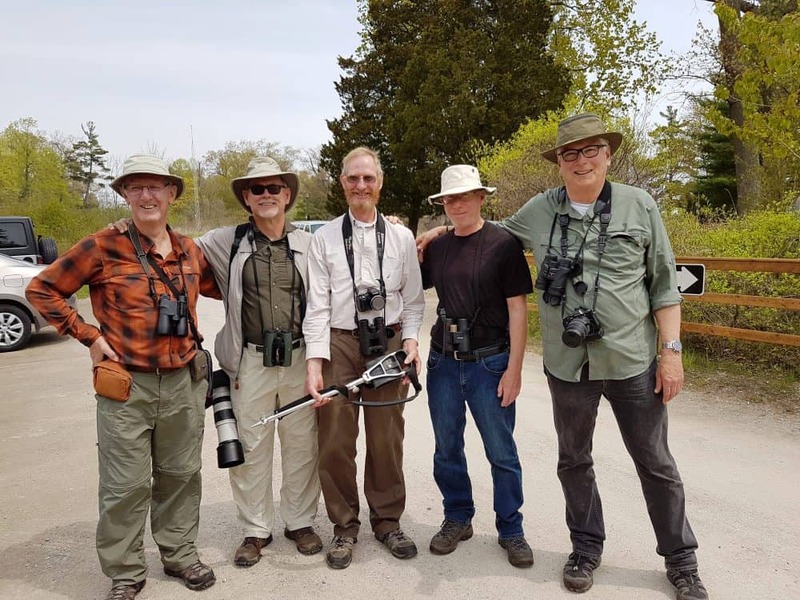 Once again this year, I made my annual pilgrimage to Point Pelee with friends Jim Cashmore, Mitch Brownstein, Brian Wales, Greg Piasetzki and Clayton Vardy. When we arrived on May 10 after a five and a half hour drive, early migrants like sparrows and kinglets were still much in evidence. A nice surprise, however, was getting close-up views of at least eight black-throated blue warblers. Over the course of the week, new species arrived daily, especially when a flow of air from the south provided a tail wind. Although we’ve been going to Pelee for years, it’s always exciting to become reacquainted with species we rarely see in the Kawarthas. 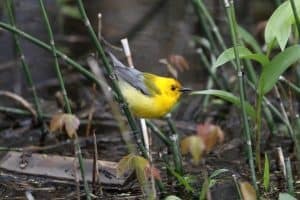 These include orchard orioles, white-eyed vireos, yellow-breasted chats, Carolina wrens, blue-gray gnatcatchers, prothonotary warblers and rarer birds like summer tanagers. The Carolinian forest, too, is quite different with abundant hackberry trees interspersed with eastern redbud, Chinquapin oak, sassafras, shagbark hickory and American sycamore. Many of the trees support huge vines of wild grape, Virginia creeper and especially poison ivy. The latter are easily identifiable by the numerous hairs that anchor the thick stems to the trunk. 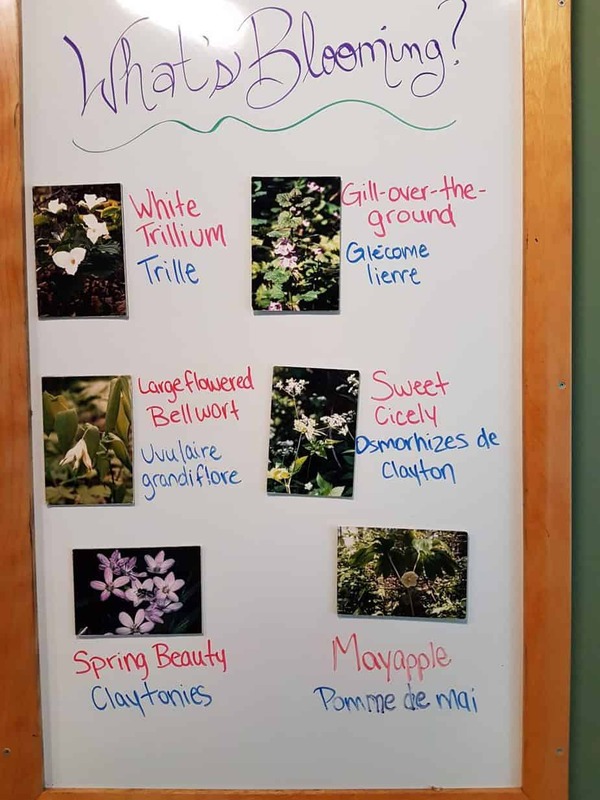 The forest floor is covered with wide diversity of flowers like sweet cicely, spring beauty, appendaged waterleaf and invasive garlic mustard. Every May, the Friends of Point Pelee organize the Festival of Birds. 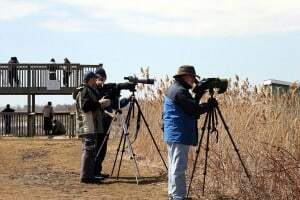 This year’s festival featured birding and wildflower hikes, twilight hikes, photography walks and a shorebird celebration at nearby Hillman Marsh Conservation Area. Here, volunteers like Jean Irons explained the basics of sandpiper and plover identification. There were also special presentations on everything from warbler and sparrow ID to learning to bird by ear. A welcoming touch this year was the free admission to the Park as part of the Canada 150 celebration. The Friends also host a very popular birder’s breakfast and lunch. Birders at Pelee take regular breaks at the visitors centre, where naturalists are on hand to answer questions and give suggestions as to where to go. 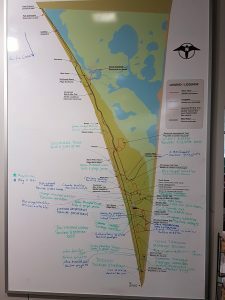 You can also consult the sightings board to see where species of special interest have been observed that day. Quite often, the birds remain in the same area for hours or even days. 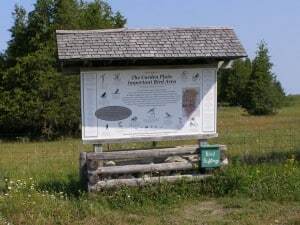 You will also find a great bookstore and displays set up by various groups like Quest Nature Tours and the Ontario Field Ornithologists. Each year offers a different mix of highlights. 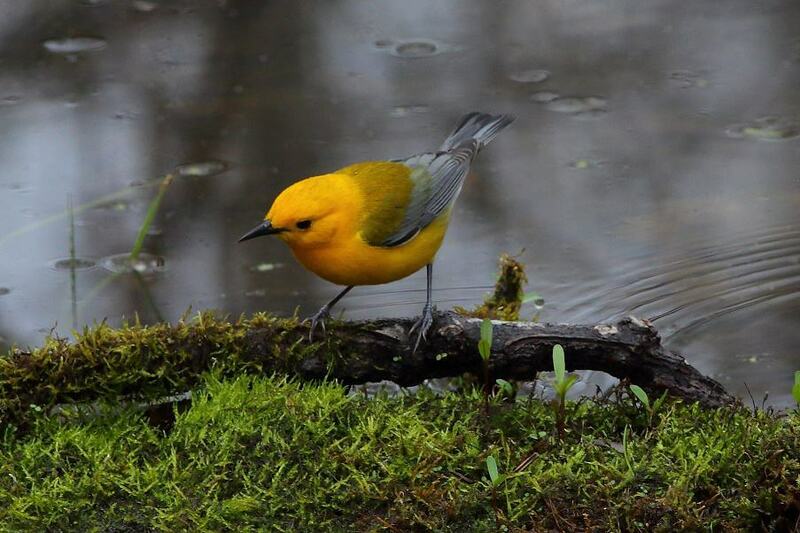 This year, great views of prothonotary warblers was one of them. On the Woodland Trail at Pelee and then again on the Tulip Tree Trail at Rondeau, we watched as they searched for food along the edge of wooded swamps. 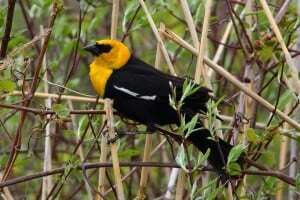 Their brilliant orange-yellow head and blue-gray wings produced a non-stop chorus of “wow!” from the appreciative birders. At one point, a spectacular male was hopping around at people’s feet. Photographers couldn’t stop clicking. Other memories that made the spring of 2017 special were the hundreds of northbound blue jays streaming overhead; the great views of spectacular male warblers like the northern parula, the blackburnian and the blue-winged; a tired and hungry scarlet tanager foraging in a pile of rocks and oblivious to the crowd only metres away; the chestnut-sided warbler that briefly landed on Mitch’s shoulder; an American woodcock and its chicks feeding along a muddy trail; observing orioles and grosbeaks building their nests; the tom turkeys displaying to females with tail fanned and body feathers puffed out; a winter wren pouring out its ridiculously long, 132-note song; a black-billed and yellow-billed cuckoo perched side by side in a tree just metres overhead; the abundance of wood thrushes, Swainson’s thrushes and veerys; and getting great views of the subtle differences between similar species like Forster’s terns and common terns and American golden plovers and black-bellied plovers. 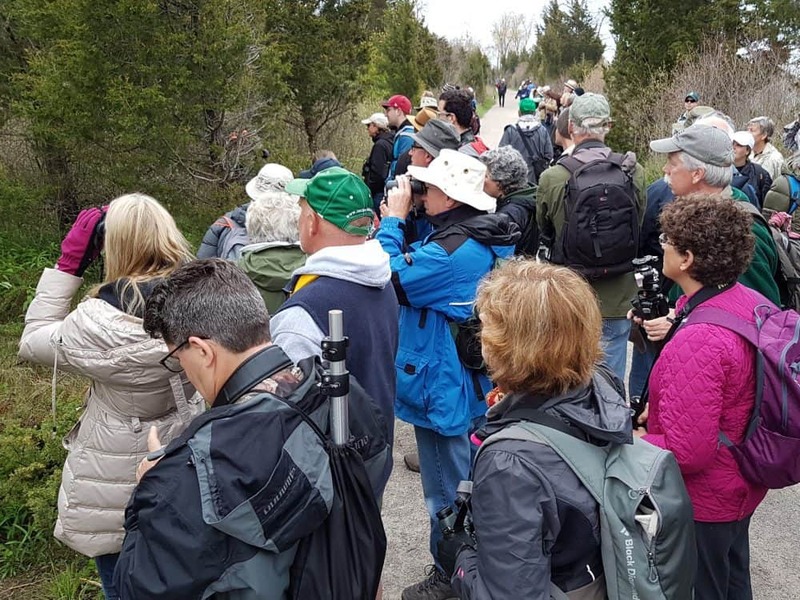 Despite the thousands of people in the Park and the sometimes-congested trails, birders show an unwavering respect for the birds and for fellow birdwatchers. Rarely do people speak in a loud voice or push their way past others. It’s not unusual to be surrounded by a dozen other birders but to still feel you have the silence of the woods to yourself. 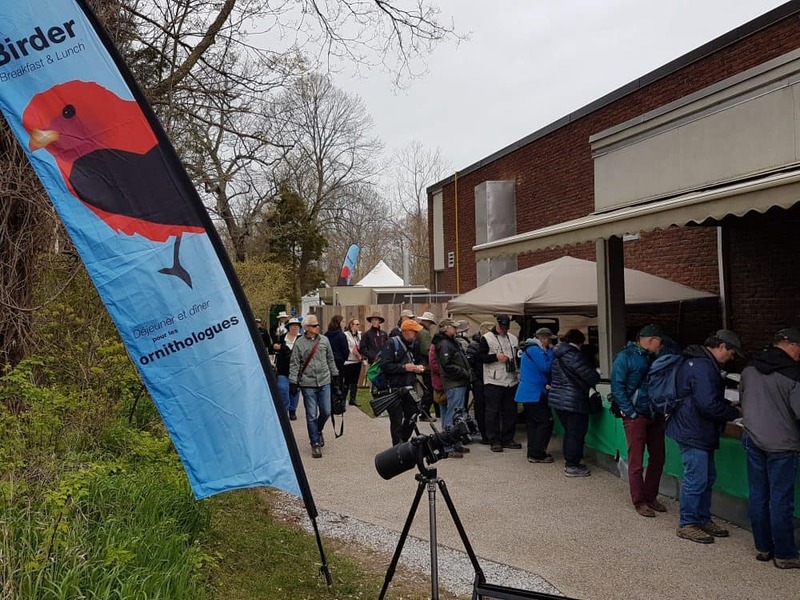 It’s also wonderful to be in the company of so many people of similar interests, to chat with visitors from all over North America and the United Kingdom and to be part of the instantaneous “sightings grapevine” in which birders share the location of sought-after species. People also help each other with identification problems and love to share what species are just ahead on the trail. Pelee also reminds me each year of why birding is so appealing. At its essence, bird-watching is an exercise in focused awareness. Yes, at one level, it is a hobby, but it is also a powerful means of developing mindfulness. When you are fully focused on finding, identifying or simply watching a given bird, it is possible to live entirely in the moment as your senses completely take over and any intrusive thoughts are swept away. There is so much information for your senses to take in: the beauty, numbers and diversity of the bird themselves, the rich orchestra of different songs, the smell of the spring air and the warmth of the May sun. By learning to see, listen, smell and feel, birding teaches us to enjoy all that our senses have to offer. There is also great satisfaction in drawing upon your knowledge of habitat, time of year, song, behaviour and field marks to make an identification. Sometimes, however, you just don’t know. This is especially true for look-alike birds like many of the vireos and flycatchers. Personally, I try to focus my attention on bird song. It provides an almost instantaneous picture of the diversity of species present as well as the number of individual birds. 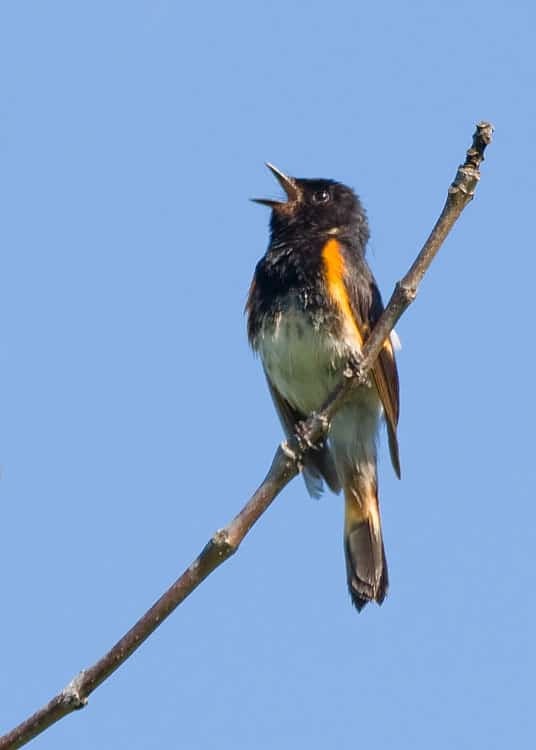 The soundscape at Pelee and Rondeau is dominated by the voices of Baltimore orioles, yellow warblers and red-winged blackbirds. The challenge, however, is to coax your brain to push these more common sounds into the background, so that the voices of less common species can be detected. 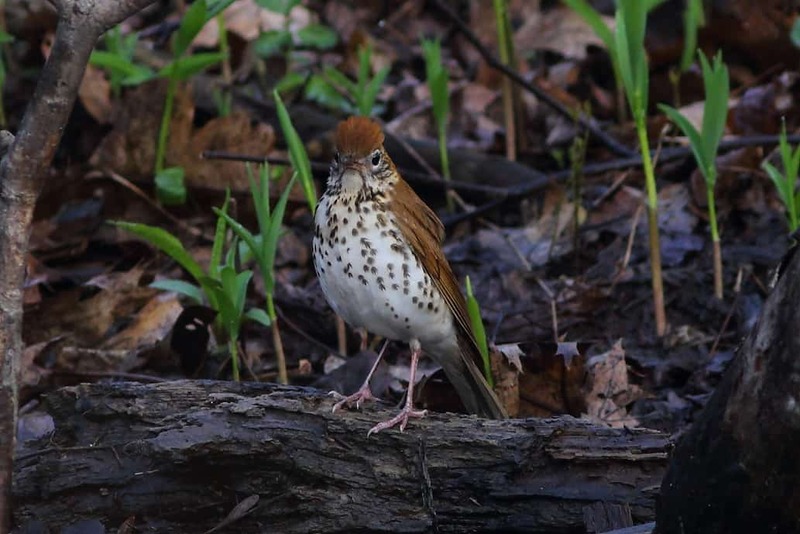 This year, the flute-like song of the wood thrush stood out all week long and was beautiful to hear. When we left Point Pelee, we headed east to Rondeau Provincial Park near Blenheim. A stop at the town’s sewage lagoon provided great views of shorebirds, five species of swallows and numerous ruddy ducks. 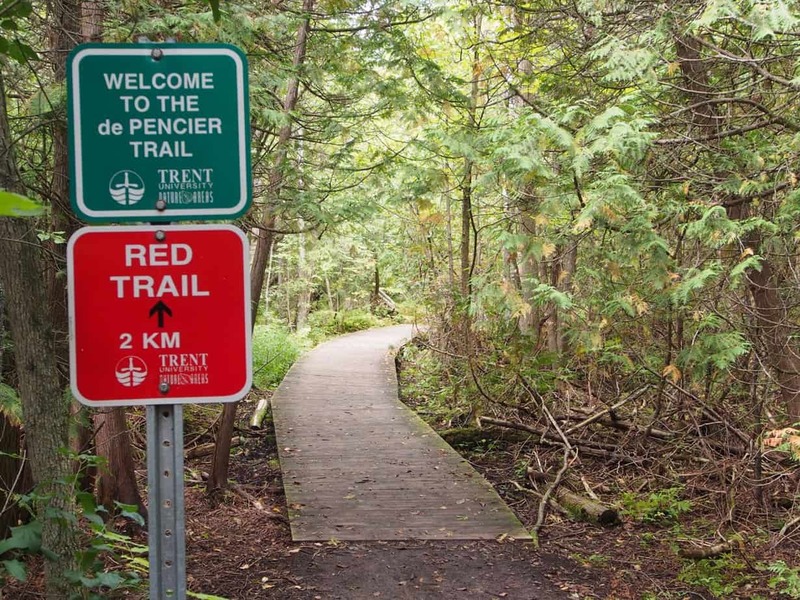 Rondeau offers a quiet counterbalance to Pelee’s frenzy. The birding can be almost as good, but there are far fewer visitors. 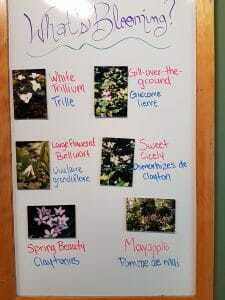 It is also a botanist’s delight with spectacular tulip trees, diverse wildflowers and intriguing ferns. The visitors centre provides many of the same services as at Pelee but on a smaller scale. 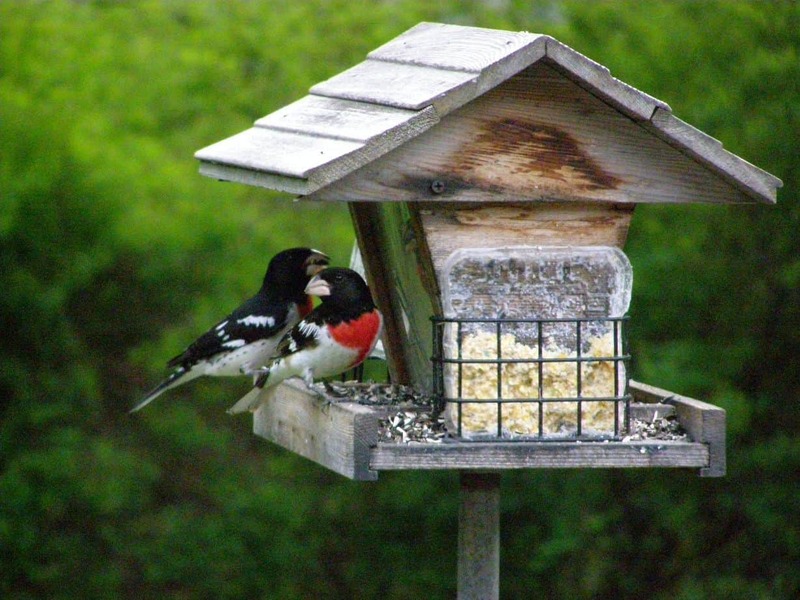 It also has a busy array of feeders that provide great photo opportunities. A visit to either – or both – of these parks is no less than a celebration of a southern Ontario spring. By any measure, birding has never been more popular. Its allure lies in the satisfaction of using one’s knowledge of season, range, habitat, field marks, song and behavior to identify and appreciate the birds around us. Birding can also become a window on environmental issues. Many environmentalists started out as birdwatchers, perhaps because you quickly recognize just how vulnerable bird popu­lations are to pressures like urban sprawl, habitat destruction and climate change. 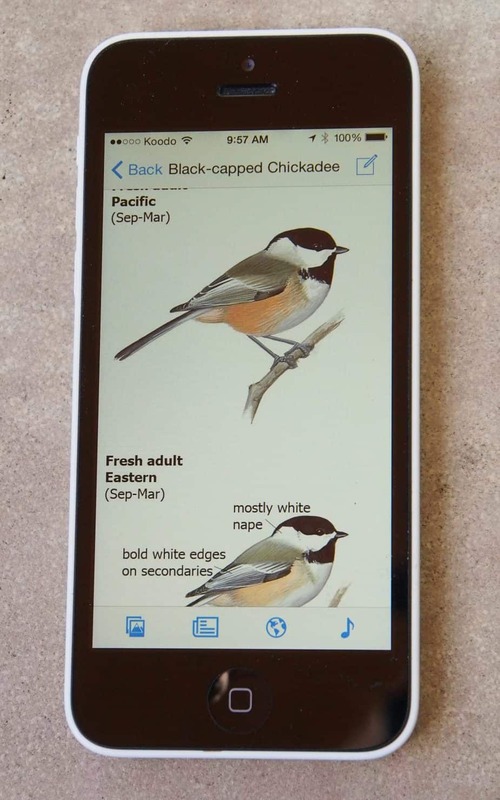 The Sibley eBird app is an excellent birding resource. Bird identification is about three things: Paying attention, being patient and knowing what to expect. Paying attention means looking and listening with complete concentration. Being patient can mean standing motion­less in a forest for several minutes until the bird you just heard sing eventually calls again and lets you know where it is lurking. In fact, one can often see more birds by standing in one good spot than by always moving. Finally, knowing what to expect means having a good idea of what species should be present in a given time of year and habitat. Experienced birders have a 95 percent idea of what they will probably see in a given day and place. Birds are found at predictable times and locations. Take note of the bird’s general shape. Many birds can be identified by shape alone, often at considerable distances. Is it stocky and short-tailed like a starling or slender and long-tailed like a grackle? Turn your attention to the bird’s size by comparing it to a common benchmark species. Ask yourself if it is closest in size to a hummingbird, spar­row, robin, crow, or goose. Examine the plumage and field marks. Take a careful look at the wings, under­parts, rump, tail and head. If you find mnemonics (memory aids) useful, think WURTH. Start with the part of the bird you can see best, but try to look at its entire body before it flies away. Try to see if it has bars on the wing or if its chest, belly and sides have spots, stripes or a special coloration. Is there anything special about the tail or rump? Pay special attention to the head. Many small songbirds such as warblers and sparrows can be identified by characteristics of the head alone. Does the eye have a circle around it? Does the crown or throat have special markings such as stripes or a contrasting color? Take note of the size and shape of the bill. Watch what the bird is doing. 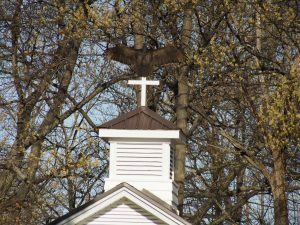 Is it feeding on the ground, perched at the very top of a tree, moving headfirst down the trunk, standing motionless in shallow water or soaring high overhead? Is it alone or with others of the same species? Some common feeder birds, for example, almost always feed on the ground in small flocks (e.g., white-throated sparrow), while others are nearly always seen on feeders (e.g., black-capped chickadee). If the bird is flying, how would you describe its flight pattern? Some hawks, for example, soar in circles on motionless wings, while others have a “flap, flap and glide” style of flying. Consult your field guide or app. Don’t forget to look at the range maps, relative abundance of the species, whether it is migratory or resident, its preferred habitat and its typical behavior. The guide will also point out the most important field marks and how the bird compares to any similar species. ~ Bird identification is not an exact science and at times it is difficult to be completely certain of what species you have seen. Being “reasonably certain” is sometimes the best you can do. ~ When you are looking at an uniden­tified bird, remember that it could be a female or an immature. Although the male and female are quite similar in most species, there are birds — the red- winged blackbird, for example — where the differences are striking. Ducks, too, show a big differ­ence between the sexes. When identifying eagles, hawks and gulls, remember that you might be looking at a juvenile or immature bird. ~ The bird in your binoculars may not be in its breeding plumage. In a small number of species (fortunately! ), the plumage can vary considerably between spring and fall. These birds tend to be colorful in the breeding season but drabber in fall and winter. American goldfinches are an example of this chal­lenging characteristic. ~ Many songbirds respond well to “pishing” and will come in quite close so that you can take a closer look. Before you begin to pish, place yourself close to some trees or shrubs where the birds you wish to attract can land. Pucker your lips and make a loud, forceful “shhhh” sound, while tacking a “p” on at the beginning: “Pshhhh, Pshhhh, Pshhhh”. Make sure it sounds shrill and strident. You might want to try adding an inflection at the end, as in PshhhhEE. Do it in a sequence of three, repeating the se­quence two or three times. At first, you’ll probably need to pish fairly loudly, but you can lower the volume once the birds get closer. Continue pishing for at least a couple of minutes after the first birds appear. This will give other species that may be present a chance to make their way towards you. Chickadees and nuthatches are especially receptive to the pishing sound, but other species like warblers and sparrows will usually approach as well. ~ The habitat in which you see the bird can also help with identification. Some species are almost never seen outside of their preferred habitat, except during migration. ~ Many birds are found along habitat edges such as the edge of a woodlot, a road or a wetland. ~ Learn common bird sounds. Identifi­cation by songs and calls will really boost your birding skills and provide a great deal of satisfaction. 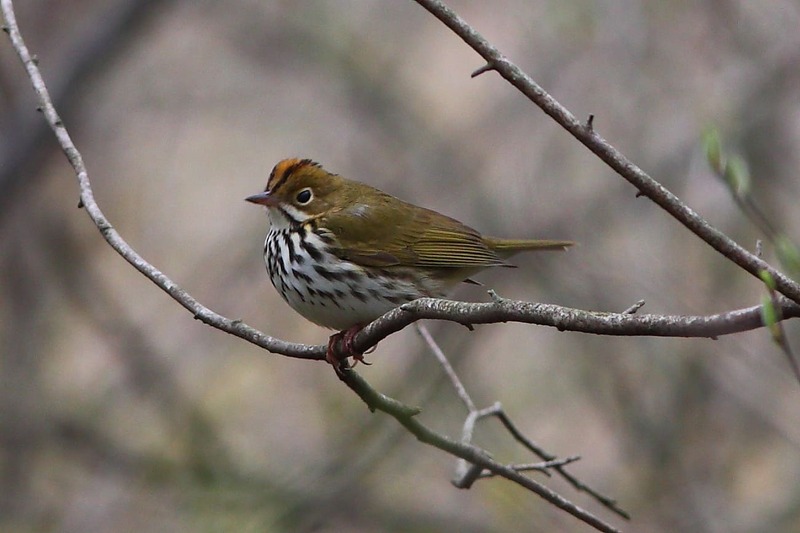 With practice, nearly all birds can be identified by song. Start by learning the songs of the common species you see and hear around your house. Listen to recordings of their songs — in the car, for example — and learn the associated mnemonic for the species you’re interested in. Chickadees, for example, sound like they are singing “Hi Cutie”. There are many bird identification apps that include songs and calls. 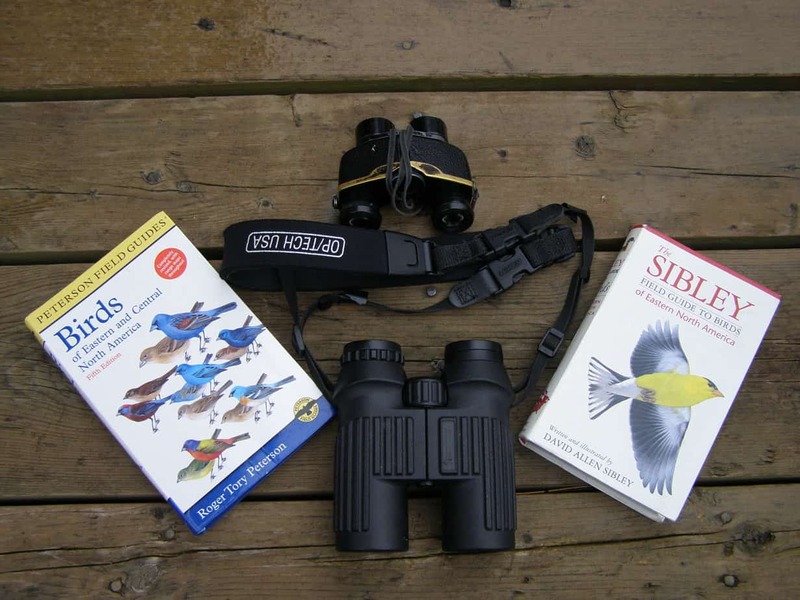 ~ Purchase a pair of good binoculars. Many bird-waters find 8 x 40 or 8 x 42 the best choice. They provide good magnification but also offer a wide field of vision. Look for a pair with a roof prism design. ~ Choose a field guide with paintings of the birds rather than photographs, and a range map right beside the illustrations. My favourite is “The Sibley Field Guide to the Birds of Eastern North America” because of its convenient size and weight and the multiple plumages it shows of each bird. 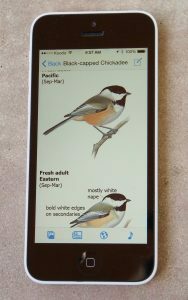 “The Sibley eGuide to Birds” is probably the best app available and includes recordings of all the songs and calls. ~ Check out seasonal abundance charts for your area. These show how the numbers of a given species change over the course of the year. With time, you will start to develop a mental checklist of what birds are most likely, given the time of year. The eBird website (ebird.org) provides these charts in the “Explore Data” section. Bird identification is one of many skills for connecting to nature. Next week, we’ll turn our attention to butterflies, dragonflies and moths. You will find more ways to develop a stronger connection to the natural world in my new “Big Book of Nature Activities: A Year-Round Guide to Outdoor Learning” which I co-wrote with Jacob Rodenburg, executive director of Camp Kawartha. The book will be available in early June. 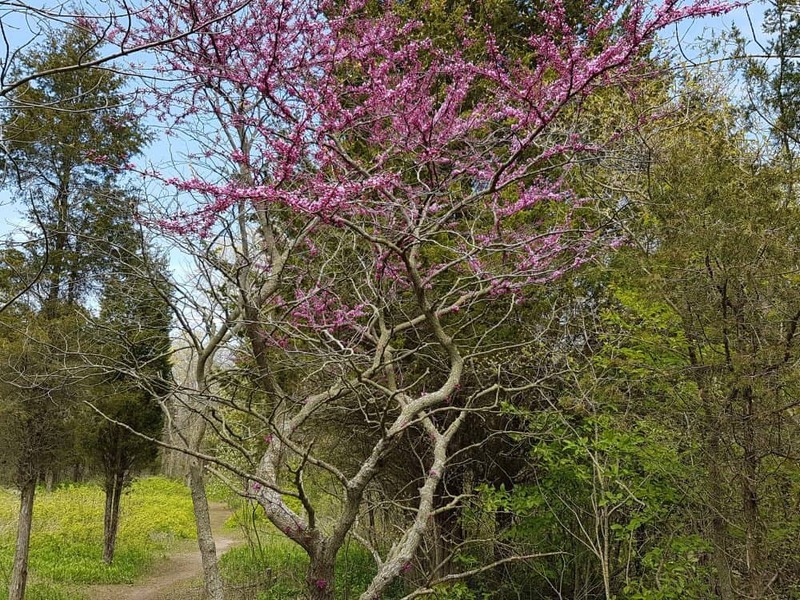 There are few better places to enjoy the beauty of a southern Ontario spring than the woodland trails of Rondeau Provincial Park. 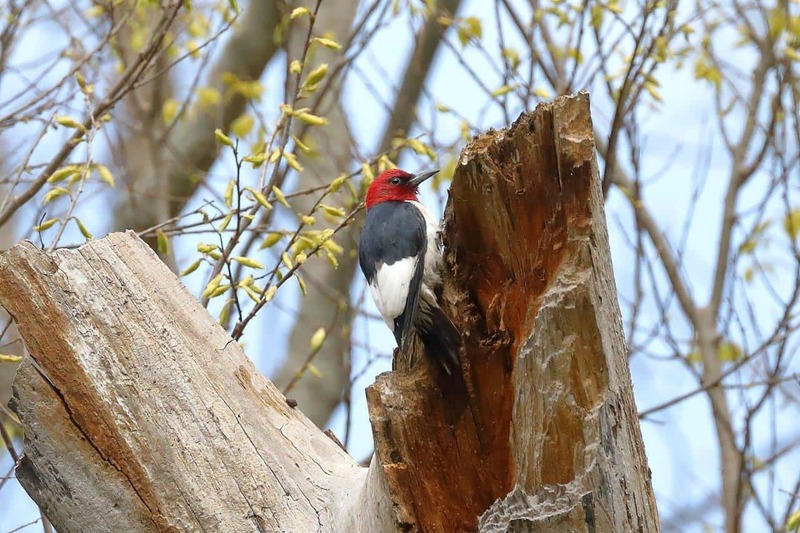 Winding through Carolinian forests blanketed with ferns and spring wildflowers, the trails routinely provide close-up views of some of our most spectacular birds. This year, the honours went to the Prothonotary Warbler. 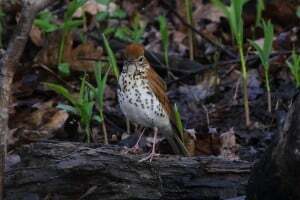 On two different occasions, we watched this rare Ontario species only metres away as it searched for food on the flooded forest floor of the Tulip Tree Trail. Its brilliant orange-yellow head and blue-gray wings produced a non-stop chorus of oohs and awes from the appreciative birders. Photographers had a field day as they clicked off one stunning picture after another. 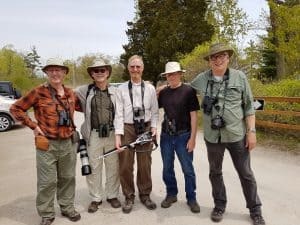 Last week, Jim Cashmore, Mitch Brownstein, Greg Piasetzki and I made our annual pilgrimage to the southern Ontario birding meccas of Rondeau Provincial Park and Point Pelee National Park. These two wooded peninsulas that jut out into Lake Erie concentrate thousands of migrant birds in the spring. 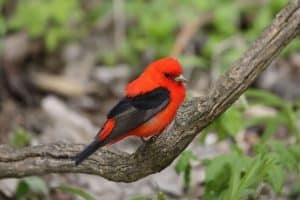 For anyone wanting to see North America’s most spectacular spring migrants – Scarlet Tanagers, Baltimore Orioles, Red-breasted Grosbeaks and more than two dozen species of warbler – a trip, Rondeau and Pelee is a must. The birding this year was good with an almost constant parade of interesting species to be seen. 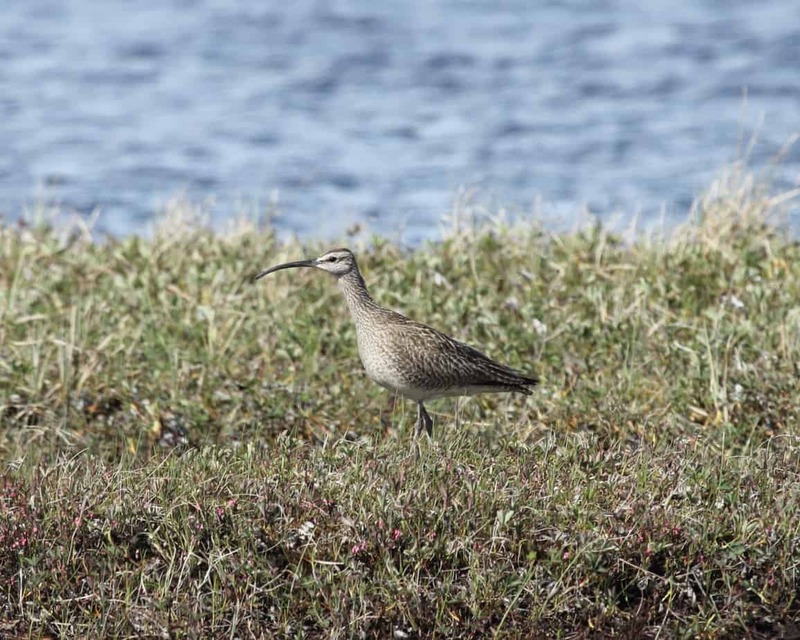 Cool temperatures and winds from the north meant that many migrants lingered in the parks for several days instead of immediately pursuing their journey northward. The cool weather also meant that the leaves were not yet out, so seeing the birds was easier than it is some years. Thrushes and flycatchers were present in especially good numbers, as were Scarlet Tanagers. 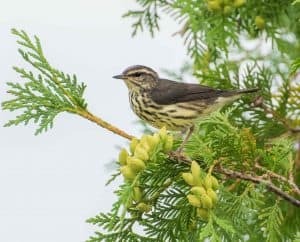 There was also an ample selection of warblers, ranging from early migrants like Yellow-rumped and Palm to species that tend to arrive later such as the Canada and Mourning warblers. By week’s end, we had managed to find about 130 different kinds of birds, 25 of which were warblers. 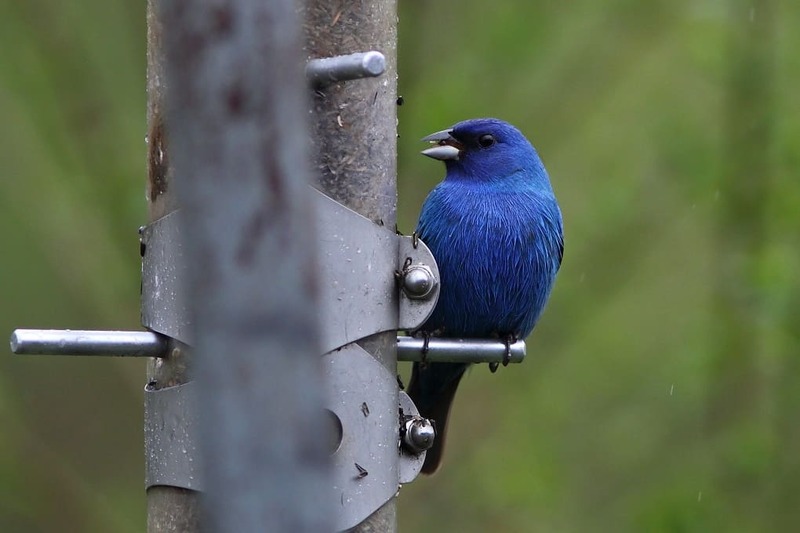 For many birders, spring birding is very much about sound. 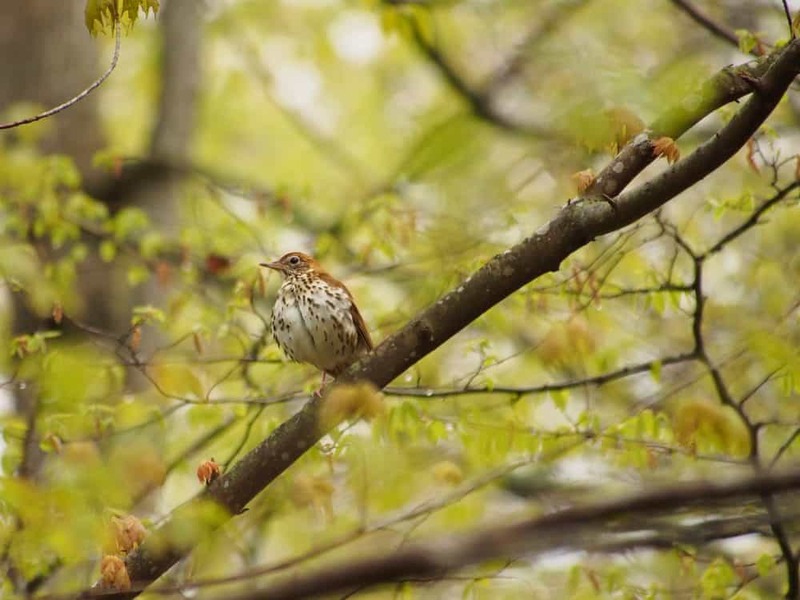 By focusing your attention on bird song, you get an almost instantaneous picture of the diversity of species around you as well as the number of individual birds. 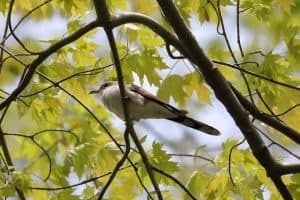 This past week, the dominant voices included Baltimore Orioles, Yellow Warblers, House Wrens and Rose-breasted Grosbeaks. 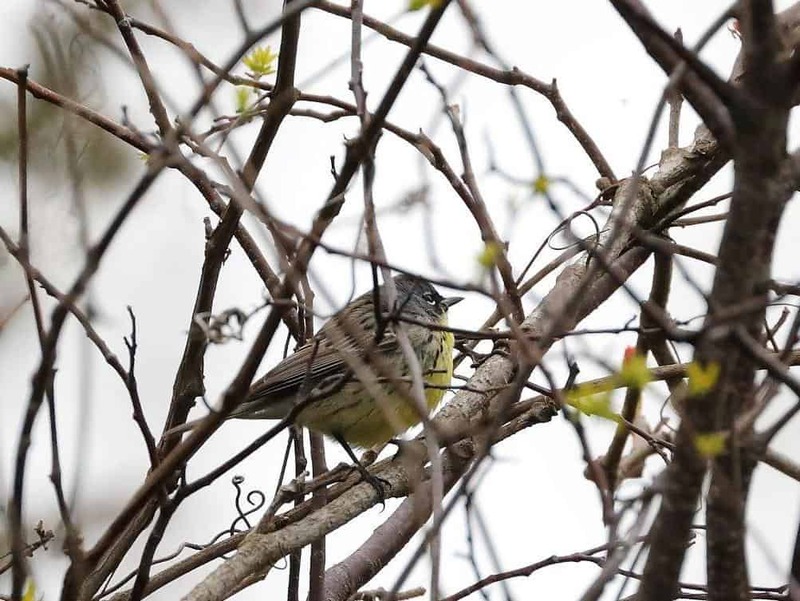 Not quite as common, but calling at least every couple of minutes were Least Flycatchers, Eastern Wood‑pewees, Eastern Towhees, Tree Swallows, Wood Thrushes, Blue-gray Gnatcatchers and Magnolia Warblers. The challenge, however, is to coax your brain to push these more common sounds into the background, so that the voices of less common species can be detected. Many iconic bird sounds belong to the night. Just after sunset one evening, we drove over to a field across from the Rondeau visitors centre. 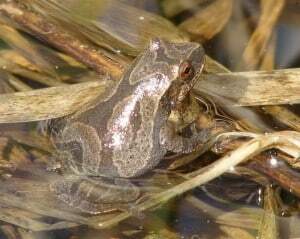 As we rolled down the car windows, the peenting calls of American Woodcocks stood out clearly against a background chorus of Spring Peepers. Almost immediately, we saw one of several woodcocks launch itself into the air, its wings producing a quivering sound as it gained altitude. Soon, we could see its silhouette against the pale pink light of the darkening sky – an iconic image of spring nights that I never tire of seeing. But that wasn’t all. Moments later, a Common Nighthawk flew by, coursing over the field like a giant moth and making a rasping nasal buzz. Finally, the quintessential species of spring and summer nights added its voice to the mix as we drove down to the South Point Trail. Even with the car windows up, it was impossible to miss the loud, repetitive call of the Whip-poor-will. On Wednesday morning, we decided to make the one-hour drive west to Point Pelee. Like Rondeau, Pelee is home to Ontario’s Carolinian forest, a habitat type that has almost disappeared from the province. 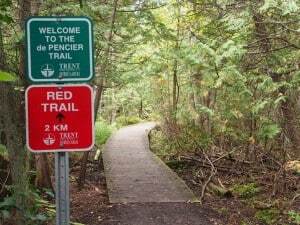 The Pelee woods are dominated by Hackberry Trees and vines such as Wild Grape, Virginia Creeper and Poison Ivy. In May, the forest floor is a carpet of Sweet Cicely, Wild Columbine and Wild Geranium. As you can imagine, the air smells wonderful. Having four pairs of eyes proved to be very handy this particular morning. Even at the parking lot, a constant parade of thrushes, orioles, warblers and tanagers moved past us, flying quickly from tree to tree and often at eye level. We eventually made our way out to the tip area and joined the throng of birders already there. Standing shoulder to shoulder on the boardwalk, we were immersed in a see of binoculars, scopes and colossal cameras. The somewhat crowded conditions were soon forgotten, however, thanks to the constant bird activity. Over the next couple of hours, we added a variety of new warblers such as the Blackpoll and Cape May, the Philadelphia Vireo and both Black-billed and Yellow-billed Cuckoo. 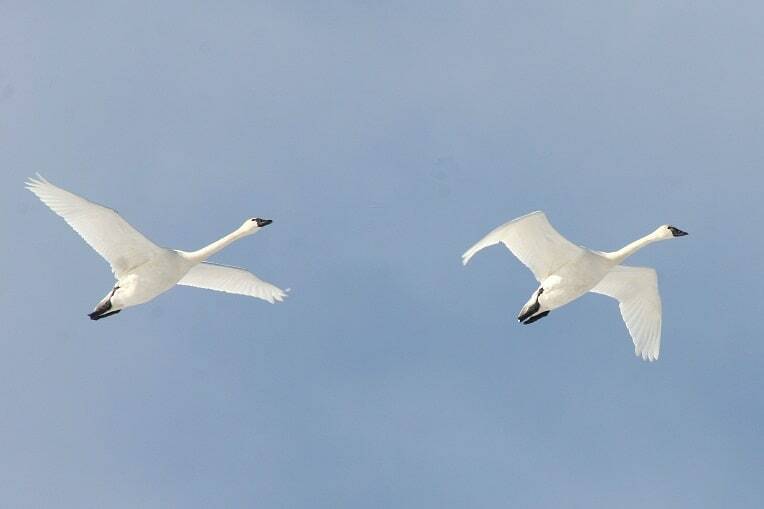 We also ran into two other Peterborough birders, namely Jerry Ball and Clayton Vardy. Jerry had been at Pelee for two weeks and had seen no less than 208 species, while Clayton was already up to 24 warbler species for the day! 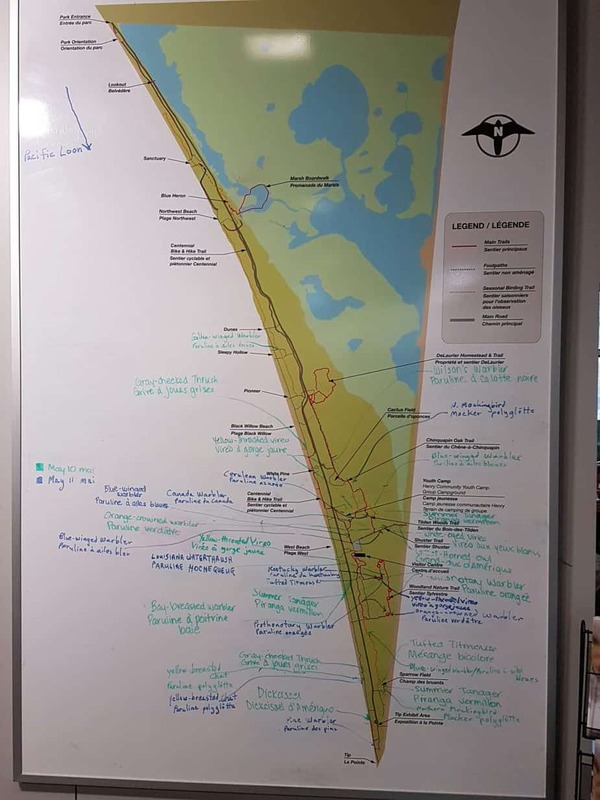 After taking a break at the park visitors centre – there are naturalists on hand to answer questions, a great bookstore and the Friends of Point Pelee provide a delicious hot lunch – we walked the Tilden’s Woods trail and a section of the park where a Kentucky Warbler had been seen. 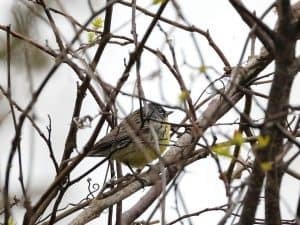 Although we didn’t find the Kentucky, large numbers of other warblers made up for its absence, including one flock with at least four Northern Parulas. We wrapped up the day with a trip north of Point Pelee to Hillman Marsh to see ducks, gulls and shorebirds. 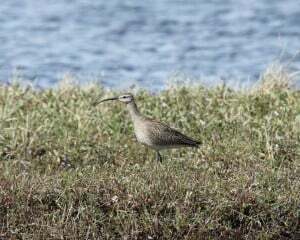 The highlights there were a Red-necked Phalarope and a Willet. Despite the rather crowded conditions on some of the trails at Pelee, respect for the birds and courtesy for fellow birders are always very noticeable. Rarely do people speak in a loud voice or push their way past others. 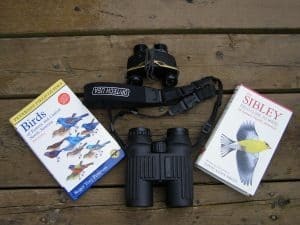 Most birders are ready to help beginners with identification problems, as well, and to share the location of sought-after species. However, it is hard not to notice that there are very few young people. 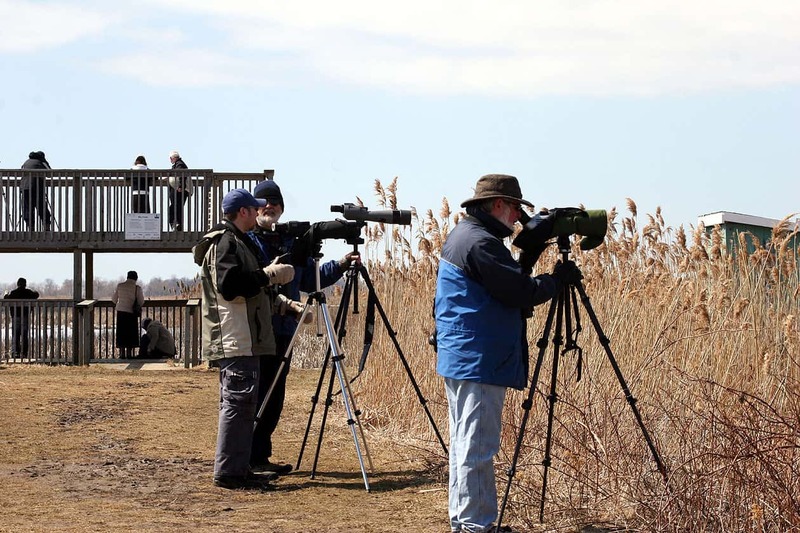 The vast majority of birders we see each year are probably 60 or older. Because birders ‑ and naturalists in general ‑ are usually committed conservationists who represent a strong voice for the protection of species and wild spaces , one cannot help but wonder what the lack of younger people means for the future. Thursday was cold and wet, so rather than spending the day at Rondeau, we drove north to Mitchell’s Bay on Lake St. Clair. 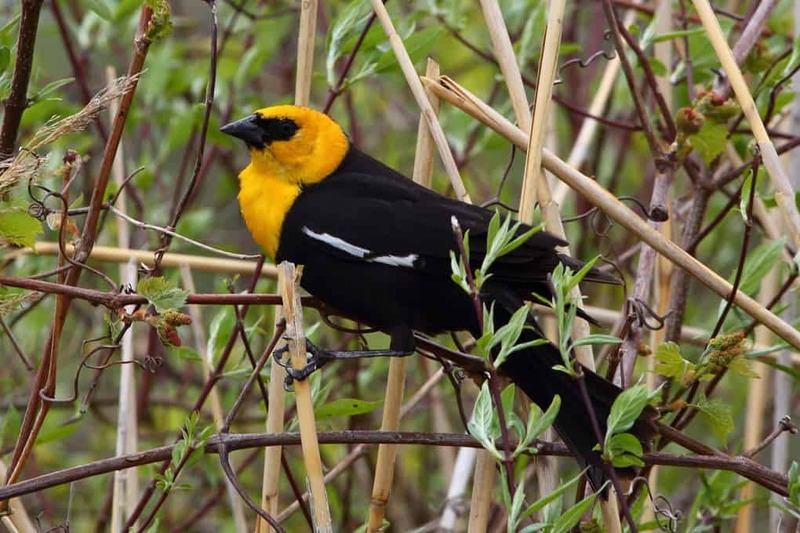 The marsh here is well known for a small colony of Yellow-headed Blackbirds, a species usually not found in Ontario. For a photographer like Greg, this outrageously coloured blackbird made for a delightful subject. The six males we found were anything but shy, as they focused all of their attention on courting the half-hidden females. The raucous wail the males made could only be described as something between a braying donkey and a piercing chainsaw. 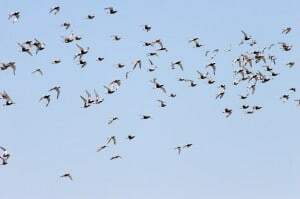 On our way back to the Park, we stopped at the Blenheim sewage lagoon, where we were greeted by the remarkable sight of thousands of swallows coursing over the lagoons and nearby fields as they snatched up tiny flies called midges. 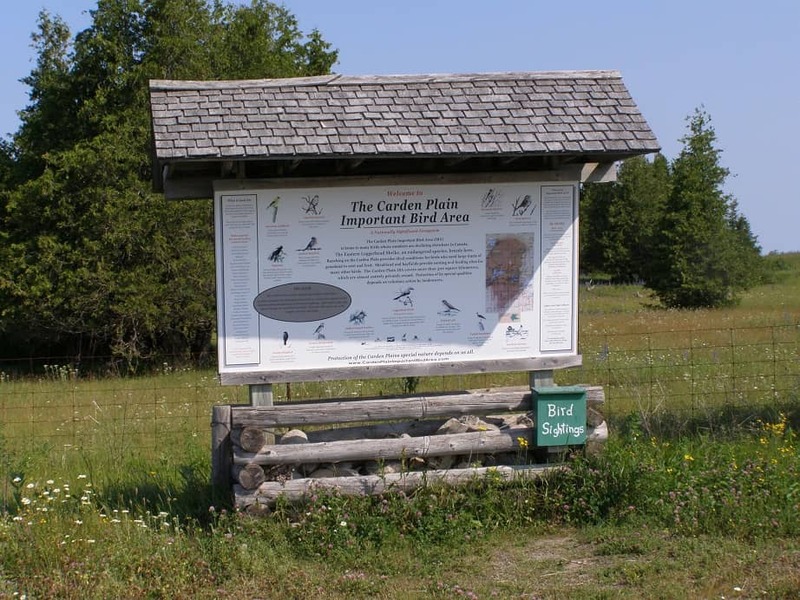 The lagoons also offered up Ruddy Ducks, Bobolinks, Savannah Sparrows and Eastern Meadowlarks, all of which are hard to find in this part of the province. 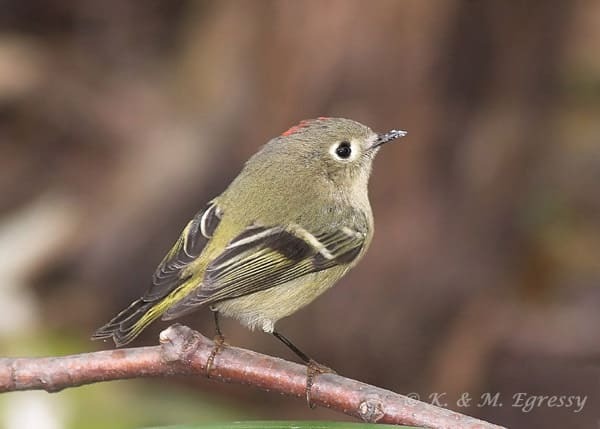 By week’s end, the greater number of female warblers – females migrate later than males – and the arrival of late migrants such as the Eastern Wood-pewee and Mourning Warbler were signs that spring’s passage of northbound birds is drawing to a close. The season of migration is now giving way to the season of nesting. 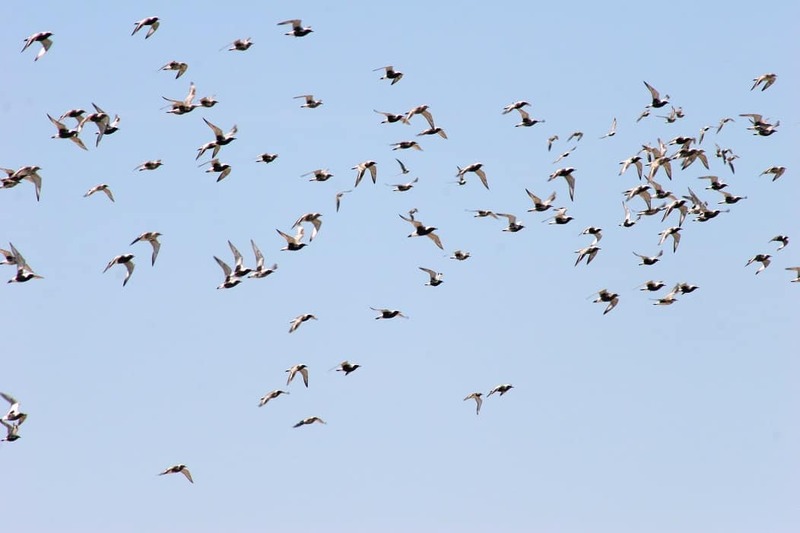 However, the change of season holds the promise of bountiful young birds that will commence their own journey – southward this time – in just a few short months.